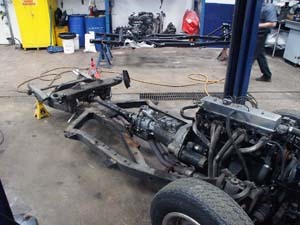 Ratco TR6 replacement frames are an excellent way to deal with rusty original frames. Stiffer than original for improved handling. 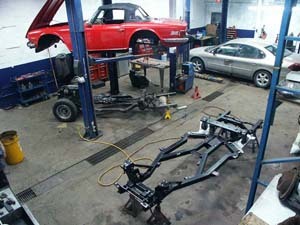 I had a Ratco frame installed on my TR-6 this winter by Len at Brittanicar in Montreal. I've told Len how much I appreciate the improvements it brings to the car, but I think it's important you know as well. When I was toying with the idea of making the move in the fall, I called you to discuss the benefits I could reasonably expect by installing a Ratco frame. Serious cracks had appeared in my old one, mostly around the rear suspension, and I had to decide between a welding job or frame replacement. This second option being several times more expensive than the first, I was trying to get some reassurance that it would not only return the car to a state of roadworthiness, but that it would provide a noticeable improvement in road handling as well. It is to your credit that you carefully avoided overselling your product. You said ".if you're expecting the car to behave like a monocoque, you're going to be disappointed. It will make a difference, but not to that extent". You went on to describe how rigid your frame was, structurally speaking, but pointed out that a chassis bolted onto a frame, no matter how rigid, has its limits. I appreciated your honesty and straightforwardness. After mulling over the problem, I decided that in spite of the cost of replacement (and perhaps because of the cost of all the previous work I'd put on that car! ), I would go ahead with the Ratco frame. It would mean keeping the car for at least another five years in order to amortize the investment, but that wasn't a big sacrifice! The job was carried out in January and February, but I had to wait till mid April to get the car onto the road because of the enormous amounts of snow that fell on us this winter. I have been driving it now for almost a month. I've owned this car since 1993 and have had major work done to it on several occasions, upholstery, paint, complete engine rebuild, transmission overhaul, clutch mods, the list is a long one. 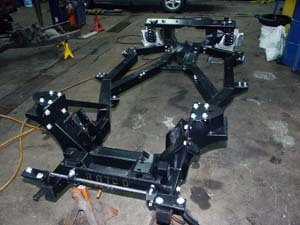 Installing a Ratco frame has been the project that has had the most immediate and dramatic effect on driving pleasure. The car feels tight, solid and responsive. These are not usually considered Triumph strong points! Guys, I'm absolutely thrilled! I thought you should know.